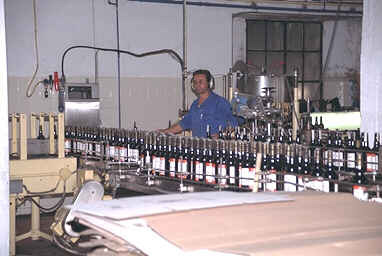 Jerez de la Frontera is famous for its sherry. Every brand has its bodega and in the morning you can visit them. 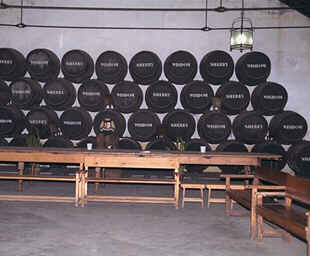 A visit includes not only viewing, but also tasting. 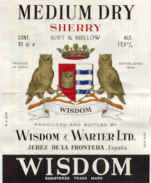 There are many types of sherry, varying in sweetness, so be prepared ! 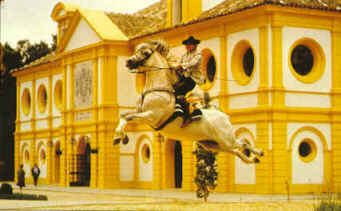 One thing in Jerez has, for as far as we know, nothing to do with sherry: the Real Escuela Andaluza del Arte Ecueste, the horse-riding school. 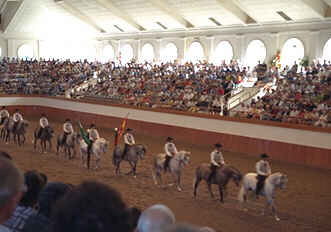 On Thursdays at 12:00 the show Como bailan las caballos Andaluces (how the Andalucian horses dance) is performed. If you want to see this very popular show, don't wait until Thursday to buy your tickets. We were lucky, one of the touringcars didn't show and we arrived early at the ticket boot (just after eleven). Some of the people who arrived later, only had a change to work at their tan in front of the riding-school. The other weekdays the training of the horses can be visited.